Summertime means ice cream! You can make your own without high fructose corn syrup, red #40, or partially hydrogenated coconut oil. 🙂 You can’t buy this one at any grocery store that I have seen. Though there is probably some stuff in the oreos we shouldn’t have. Oh well. Can’t win them all! Maddox asked for Mint Oreo Ice Cream. I asked him if he wanted it with chocolate ice cream or vanilla, he said chocolate so here we are! 1. Melt chocolate in double boiler or microwave a little at a time. Whisk in cocoa and heat through. Whisk in milk and cool. (This is the part I get frustrated with and cannot ever get the chocolate to completely melt into the milk, but then again I can’t stand at the stove forever with 2 small children running around. So just try to get it as best you can.) I put my pot in the refrigerator to cool the mixture faster. 2. Put the cooled chocolate mixture through a fine mesh strainer – be sure to catch all the chocolate liquid below! Push the chocolate up against the strainer to get every drop. Whisk in the eggs, sugar, cream, extracts and cool the mixture in the refrigerator for 1-2 hours. 3. Pour into your ice cream maker per their instructions. 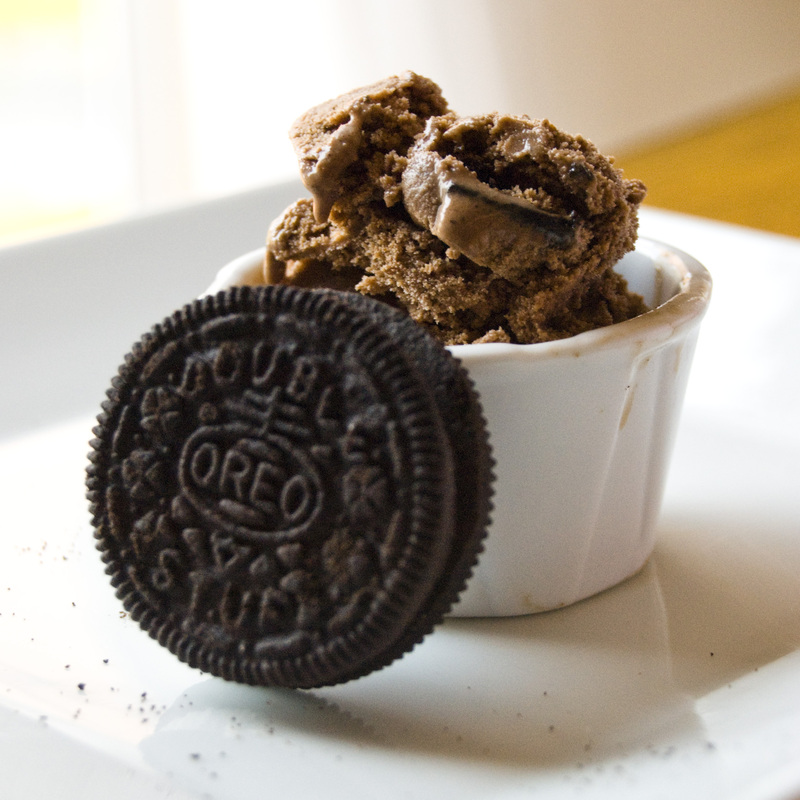 5 minutes before your ice cream should be done, pour in the crushed oreos. If you are deathly afraid of the raw egg. #1, leave it out. or #2 scald the chocolate milk mixture and temper the eggs into it and cook until it coats the spoon. Cool and then whisk in the sugar, cream and extracts just before putting in the ice cream maker. Thanks for posting! I have that same Ben and Jerry’s Cookbook. Made this for Father’s Day. It was delicious.